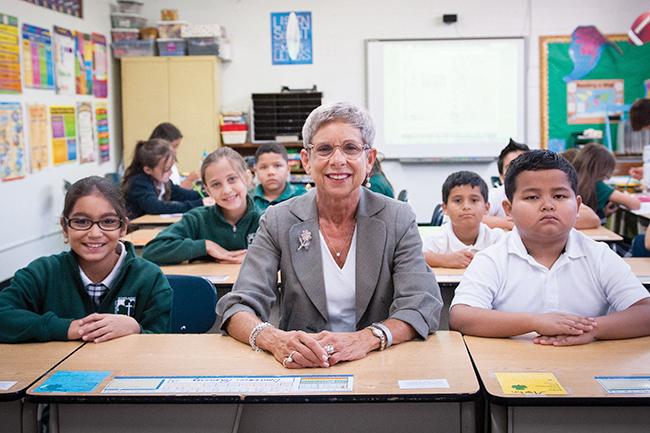 Kathy O’Hara is the superintendent of archdiocesan schools. As National Catholic Schools Week 2019 begins, I find myself reflecting on my own journey in Catholic schools and the importance of the people I have met along the way, especially one in particular. I have vivid memories of Sister Dorthea (first grade) teaching us how to read; Sister Renee (fourth grade) instilling in me a love of art; Sister Judith (eighth grade) recognizing a talent for dance and acting. In high school, I distinctly remember our chaplain asking me one day if something was wrong because I did not seem to be my normal, positive self. Similar to my first 12 years of Catholic education, my college years were filled with individuals who did not let me stray into the “free love” culture of the late ’60s and early ’70s. Faculty and staff were strong role models and resolute in their faith, and so joyful. I remember feeling very secure in my faith in an unsettled world. Fast forward to life in the ’80s and ’90s when Jim and I were raising our children. By the grace of God and supportive pastors, our five children were able to attend Catholic elementary and high schools. So many of our children’s teachers impacted us as parents in a positive way. Some of these teachers are now school leaders in our Catholic schools today, and I still learn from them! However, one particular individual is someone who has impacted thousands of lives throughout his time in Catholic schools and has dramatically impacted my life during the past 20 years. Blake Mulvany served as the first lay principal at Bishop Ward High School in Kansas City, Kansas; first president at St. Thomas Aquinas High School in Overland Park; and superintendent of Catholic schools. Anyone who was privileged to know Blake in these roles, or when he coached boys basketball, served on state athletic and education committees, was active in what was then the North Central Accrediting Agency (now known as AdvancEd), or as one of the founders of the Catholic Education Foundation, knew his vision and philosophy about Catholic schools. Simply stated, Blake believed in the importance of relationships above all else. There were two relationships which Blake always stressed — our students’ relationships with Our Blessed Mother (to whom Blake has a great devotion) and to Jesus Christ. As I visit schools throughout our archdiocese, I see Blake’s vision alive and well.